My Dream Job started with Lobsters! This week I revisited the place that started my new creative business, “Picture your ideas” with Dr Sue Pillans. About 18 months ago a friend and fellow female scientist, Dr Eva, asked me if I would be interested in combining my science and art to graphically record a meeting about the science of the Tropical Rock Lobster fishery in Torres Strait. I didn’t hesitate to say ‘yes!’ and travelled to the top of Australia with the CSIRO team to ‘draw out’ the science of the lobster fishery with indigenous fishers. 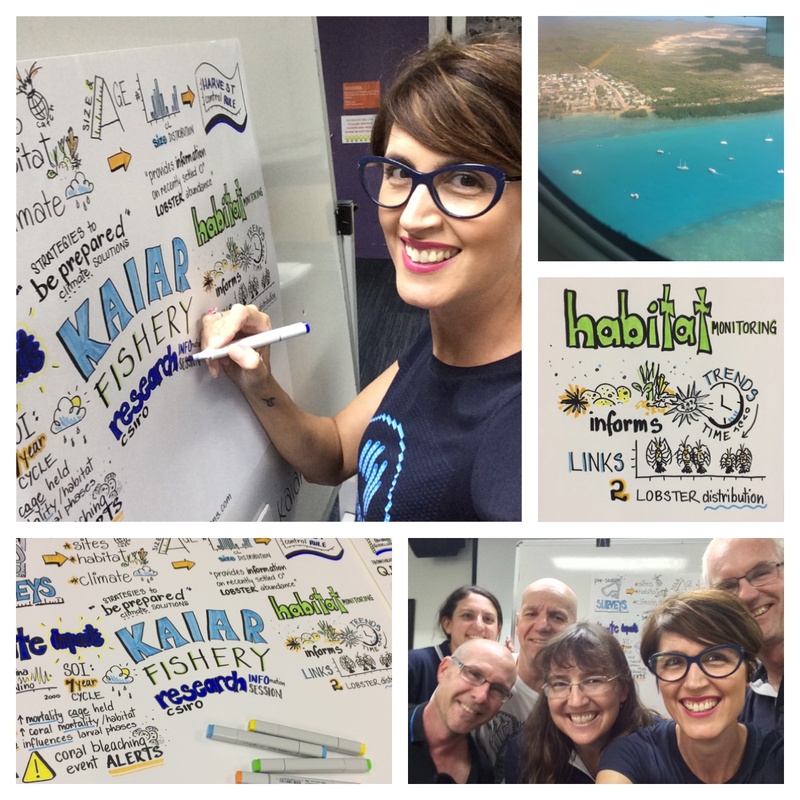 This week I was delighted to return to beautiful Thursday Island to draw out the big picture of CSIRO’s latest science information session with the lobster fishers. What a beautiful part of the world and what a lovely community to work with…and I love lobsters! So it was a very special trip for me as it reminded me of a few important things which I sometimes forget whilst busily running my own creative business: I am lucky to be surrounded by so many great people that support me in my new creative journey; I am grateful for all the opportunities that come my way to “picture your ideas”; and I’m proud of myself for taking a chance and following my heart (and star) to turn something I love into something I live. So a BIG thank you to Dr Eva, all of my supporters and of course the Lobsters!! You can follow my creative journey via my alter ego Dr Suzie Starfish on Facebook (http://www.facebook.com/drsuziestarfish) and @suepillans on Twitter and Instagram.